Refrigerated juices once again led growth in the juice segment this year, with strong gains in almost all varieties, and while that alone is enough to mark a successful category, this summer's news that PepsiCo has entered that market with the purchase of Tropicana brought even more attention to the segment. According to data from Information Resources Inc., the supermarket refrigerated juice segment increased 6.8 percent last year, to almost $2.5 billion. Tropicana Pure Premium picked up more than 4 percent market share, giving it 34.4 percent of the market, and had sales gains of more than 20 percent. Pure Premium's volume increased by about 17 percent. Minute Maid Premium also increased its share of market significantly, jumping from 7.8 percent last year, to 19.3 percent this year. A volume increase followed at about 15 percent. *Totalmay not equal 100 percent because not all brands are listed. 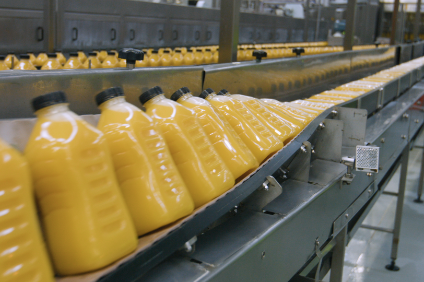 Private label orange juices lost about 2percent market share, but they had sales increases of 1.5 percent, and volume increases of3.3 percent. Florida's Natural gained almost 13 percent in dollar sales, with an almostequal 13 percent in volume. And Florida's Natural Growers Pride saw a dollar salesincrease of more than 28 percent, with a volume jump of almost 31 percent. Losing ground in the refrigerated categorywere Florida Gold, with a 21 percent sales drop, and a 15 percent volume drop; andTropicana Seasons Best, which fell 14 percent on an equal drop in volume. The 20 percent jump in sales for categoryleader Tropicana Pure Premium is due largely to its value-added varieties such as calcium-and vitamin-enriched juices, according to company spokesman Mark Gutsche. Tropicanarecently re-launched its calcium-enriched orange juice with a new form of calcium that itsays improves the efficacy of the product. According to Gutsche, volume of the product hasnearly doubled since its reintroduction. And of course Tropicana also made headlinesthis summer with its sale to PepsiCo. The sale isn't necessarily big news because of theresources PepsiCo can put behind the juice company; former owner Seagram had its own largecoffers to dip into. It is significant for the synergies it can bring to the brands,especially in large supermarket chains. Distribution of refrigerated juices differs fromthat of soft drinks, relying on transportation by train and the use of food brokers, aswell as being subject to commodity pricing. However, the combination of the largestselling juice brand, the second-largest soft drink brand, and the largest snack foodbrand, Frito-Lay, makes PepsiCo a powerhouse in the battle for supermarket shelf space. "The acquisition of Tropicana Productshas strengthened our corporate beverage portfolio with the best selling brand by far ofchilled orange juice, and further increased our importance to the U.S. retail groceryindustry, moving PepsiCo up to become the second-largest supplier in terms of salesimportance, and the largest contributor to retailers' net profits," the companyreported in its third-quarter statement. Take that to mean competition in this alreadycompetitive beverage category isn't about to let up. Other varieties of refrigerated juices alsofared well - the segment as a whole increased 5.7 percent in supermarkets, to $3.7billion. Orange is by far the largest component of those sales, but its citrus sibling,grapefruit, also saw big increases this year. Refrigerated grapefruit cocktails/drinks hadan almost 79 percent increase in dollar sales, and a 62 percent increase in volume.Refrigerated blended fruit juices had a sales increase of almost 18 percent this year. On the downside, sales of refrigeratedapple juice dropped almost 25 percent, to about $9 million, and refrigerated grape juicedropped by a whopping 90.4 percent in supermarkets. The shelf-stable category saw a healthyincrease of 6.6 percent in food, drug and mass merchandise outlets combined, according toIRI's data. Cranberry juice led the way, with a huge 135 percent sales increase. 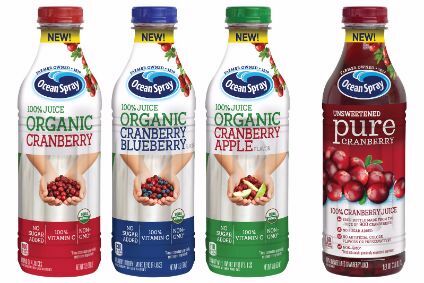 Thebattle between cranberry leader Ocean Spray and its former co-op grower NorthlandCranberries, Wisconsin Rapids, Wis., is likely responsible for that sales jump. Northlandpumped new interest into the category in 1996 when it introduced its 100 percent juiceblends, advertising the fact that Ocean Spray's juices were blended with sugar and water.Ocean Spray shot back this spring with Wellfleet Farms, its own line of 100 percent juiceblends. The category's 120 percent volume gain vs. its 135 percent dollar gain reflectsthe higher price of the 100 percent juices.